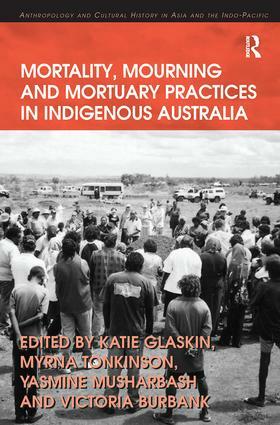 Drawing on ethnography of Aboriginal and Torres Strait Islander communities across Australia, Mortality, Mourning and Mortuary Practices in Indigenous Australia focuses on the current ways in which indigenous people confront and manage various aspects of death. The contributors employ their contemporary and long-term anthropological fieldwork with indigenous Australians to construct rich accounts of indigenous practices and beliefs and to engage with questions relating to the frequent experience of death within the context of unprecedented change and premature mortality. The volume makes use of extensive empirical material to address questions of inequality with specific reference to mortality, thus contributing to the anthropology of indigenous Australia whilst attending to its theoretical, methodological and political concerns. As such, it will appeal not only to anthropologists but also to those interested in social inequality, the social and psychosocial consequences of death, and the conceptualization and manipulation of the relationships between the living and the dead. Contents: Series Editors’ Preface: The transformative processes of life and death, Andrew Strathern and Pamela J. Stewart; Introduction: indigenous ways of death in Australia, Victoria Burbank, Katie Glaskin, Yasmine Musharbash and Myrna Tonkinson; 'Sorry business is Yapa way': Warlpiri mortuary rituals as embodied practice, Yasmine Musharbash; Solidarity in shared loss: death-related observances among the Martu of the Western desert, Myrna Tonkinson; Death and health: the resilience of 'sorry business' in the Kutjungka region of Western Australia, Brian F. McCoy; Time wounds: death, grieving and grievance in the Northern Kimberley, Anthony Redmond; A personal reflection on a Saltwater man and the cumulative effects of loss, Katie Glaskin; Social death and disenfranchised grief: an Alyawarr case study, Craig Elliott; 'Promise me you'll come to my funeral': putting a value on Wiradjuri life through death, Gaynor Macdonald; Death, family and disrespect in a Northern Queensland town, Sally Babidge; A place to rest: dying, residence, and community stability in remote Arnhem Land, Marcus Barber; A life in words: history and society in Saibai Island (Torres Strait) tombstones, Richard Davis; 'We don't want to chase' em away': hauntology in central Cape York peninsula, Benjamin Richard Smith; Afterword: demography and destiny, Frances Morphy and Howard Morphy; Glossary; Index. Katie Glaskin is a Lecturer, Discipline of Anthropology and Sociology at the University of Western Australia. Myrna Tonkinson is an Honorary Research Fellow, Discipline of Anthropology and Sociology at the University of Western Australia. Yasmine Musharbash is a Postdoctoral Research Fellow, Discipline of Anthropology and Sociology at the University of Western Australia. Victoria Burbank is Associate Professor of Anthropology, Discipline of Anthropology and Sociology at the University of Western Australia.